Our Spring bouquet is just what every home needs to welcome this eventful and abundant season. This professionally designed fresh flower arrangement boasts the perfect balance of bright colours, softer tones, and rich green aspects. To create this floral masterpiece, our team includes only the very best Avalanche Roses, Germinis, Tulips, Freesia, Statice, and Feeling Green Chrysanthemums. 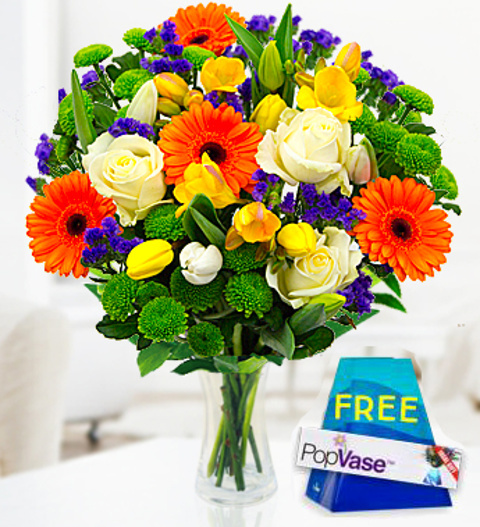 This gorgeous bouquet is perfect for all occasions and is available for next day delivery. Spring comes with a FREE box of luxury Belgian chocolates. Chocolates may contain nuts.